Includes the names: Paul Janeczko, Paul Janeczko, Paul B. Janeczko, Paul B. Janeczeko, Editor Paul B. Janeczko, Janeczko Paul Selected by, Paul B. Compiled by Janeczko, compiled by Paul B. Janeczko. Paul B. Janeczko's book Secret Soldiers: How the U.S. Twenty-Third Special Troops Fooled the Nazis is currently available from LibraryThing Early Reviewers. Paul B. Janeczko's book Double Cross: Deception Techniques in War was available from LibraryThing Early Reviewers. Paul B. Janeczko is currently considered a "single author." If one or more works are by a distinct, homonymous authors, go ahead and split the author. 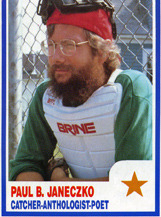 Paul B. Janeczko is composed of 9 names. You can examine and separate out names.